What does a penny buy? 11-minute call to U.S., 10-minute call to Cyprus, 9-minute call to Canada, 5-minute call to Germany, 5 minute call to England, or 2½-minute call to China. If you’re new to wholesale terminations, be advised that carriers change their rates regularly and, from time to time, every carrier experiences outages. Not to worry. For a modest additional charge, TelecomsXchange will manage rates and provide automatic failover for carrier outages. Simply choose TelecomsXchange as your preferred provider to the outbound destinations desired. Before we get into the nuts and bolts of configuring Asterisk to use TCXC carriers for wholesale call terminations, let’s spend a minute discussing the architecture of the FreePBX® trunk and outbound routes model. In this design which you will find in most Incredible PBX® implementations including Issabel 4, Incredible PBX for CentOS and Ubuntu, and Incredible PBX for the Raspberry Pi as well as in other Asterisk distributions including AsteriskNOW® and the FreePBX Distro®, the administrator specifies Trunks for each provider and then assigns Outbound Routes for calls using those providers. 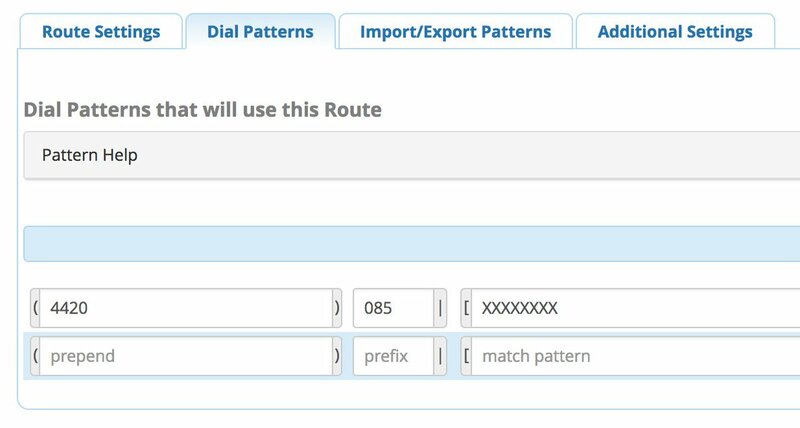 When calls are placed, FreePBX chooses an Outbound Route based upon the dial string match specified in the route. 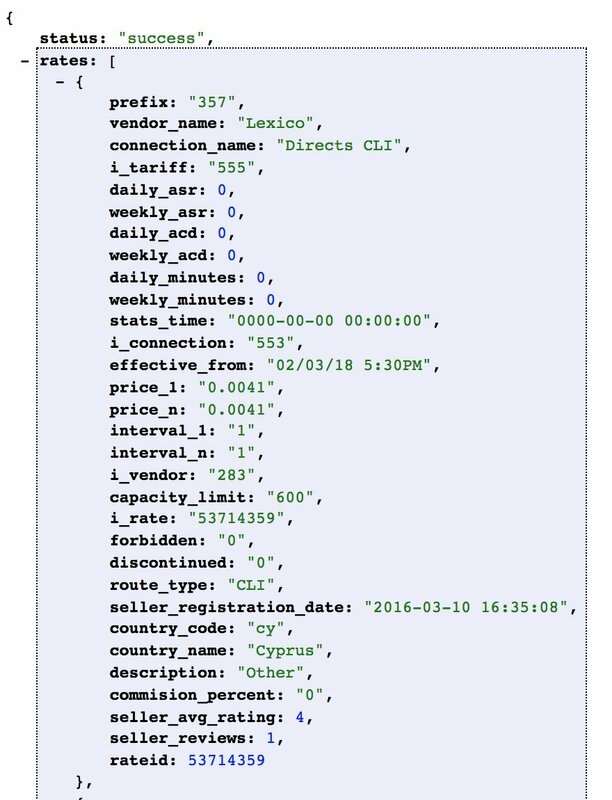 If you have a dozen outbound routes, dialed numbers are analyzed against dial strings specified in each Outbound Route, and the routes are examined from the top to the bottom of the list. 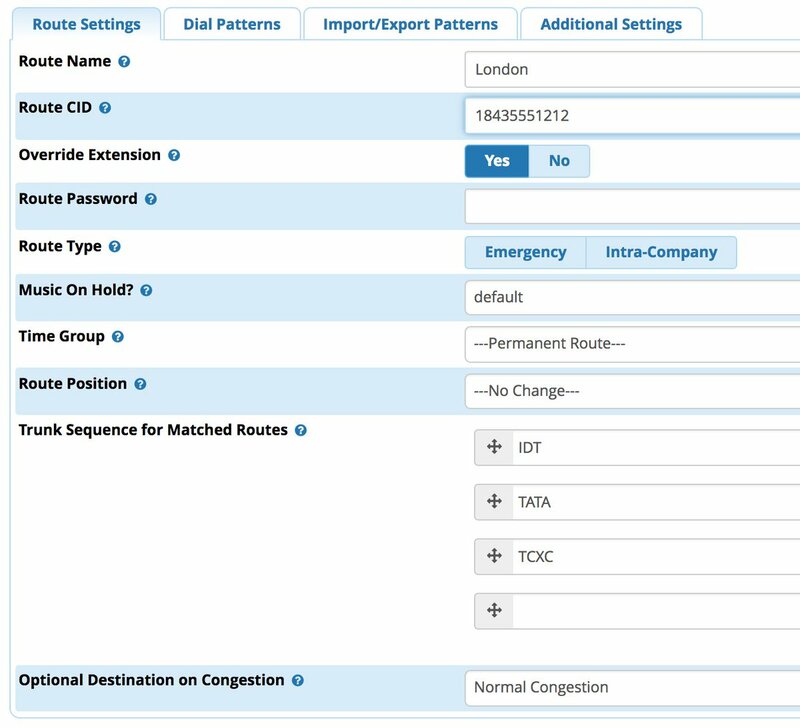 Once FreePBX chooses an Outbound Route to process a call, that ends the Outbound Route selection process. No other Outbound Route is ever considered whether it has a matching dial string or not. And it doesn’t matter whether the call fails or not, no other Outbound Route is attempted. The good news is that, within every Outbound Route, you can specify multiple Trunks which will be used in the order you’ve chosen to complete the call. If the ninth trunk happens to be the first trunk that doesn’t experience congestion, then the call will be routed to carrier #9. Keep in mind that calls to the previous eight carriers have to be attempted before we ever get to carrier #9. For this reason, it is important to create a Trunk for every carrier and specify multiple Trunks in every Outbound Route to avoid failed calls. Or, as noted above, you can specify TelecomsXchange as your final Trunk in every Outbound Route and leave it to TCXC to identify a working carrier to complete your call. In this way, you never have to worry about failed calls even though some may cost a little more depending upon carrier outages. So that’s how VoIP terminations work. You’re now an expert! The first step in your wholesale VoIP adventure is to sign up for an account with TelecomsXchange. Unless you’re chomping at the bit to pay the $650 annual fee, use our referral link. Your PBX will need a public IP address but, if it happens to be a dynamic IP address assigned by your provider, don’t worry. It’s easy to change it down the road, and we’ll show you how. Obviously, a cloud-based PBX makes this easier since you get a dedicated IP address, and this Nerd Vittles article provides several options. Once you receive your credentials, simply login to the TelecomsXchange web site. Just a few words about how the site is organized. Dashboard is where you’ll land when you login. Accounts let you specify more than one account to be associated with your credentials. If you manage multiple PBXs, this is where you set things up. Each account must have a unique IP address. This is also where you can change the IP address associated with your primary account if the need ever arises. My Interconnections displays each of your accounts and all of the carriers you’ve chosen to associate with each account. Market View is where you search for prices and choose carriers to associate with your account(s). We’ll cover this one in more detail a little later. Payment History tracks all of your payments to TelecomsXchange by date. Call Statistics lets you download CDR and Stats data by the day, week, or month. CDR gives you an instant snapshot of your calling history and the price of the calls based upon criteria you specify. It’s very similar to the same feature in the Incredible PBX or FreePBX GUI. Preferences let you change settings for your account. The item you’ll need to use first is the plus sign (+) at the top of the form. This is how you fund your account. As noted previously, there is a 13% wholesale surcharge and this will be deducted from whatever amount you choose to add to your account. For example, if you add $100 using PayPal, the PayPal fee plus 13% will be deducted from the $100. So your account would show an available balance of approximately $84. Cash or bank wires also are accepted. Finally, here’s a link to the TelecomsXchange Knowledge Base and Help Center. There’s lot of helpful information there to get you started. Let’s walk through the procedure to add new carriers to your account. This is the first thing you’ll want to do after you get your credentials and fund your account. Begin by making yourself a list of the countries or dialing prefixes you’d like to call using TCXC wholesale carriers. The easiest way to perform searches and find carriers is to decipher the dialing prefix for the calls you wish to make. For example, to call London, the Prefix would be the U.K. country code (44) plus the London city code (20). To add a carrier to your account, simply click on the plus sign (+) on the right side of the Action column beside the carrier of your choice. You then can choose whether to add it to all of your accounts, or you specify the account to which the carrier should be added. If you want to review the carrier’s history and ratings with TCXC, click on the Information icon in the Action column beside the carrier of your choice. For NANPA call destinations, specify 1 plus the area code in the Prefix field. You can add the first 3 digits of the exchange to drill down further. Be advised that adding the 3-digit exchange may eliminate a number of carriers that only specify rates for an entire area code. For example, if a carrier specifies an area code rate for 1212 and no exchange limitations, then searching for 1212652 would not return that carrier. If you already know which carriers you’d like to add, just search for them by specifying the carrier name in the Seller field and leaving the Prefix field blank. To get started, here are a few favorites for U.S./Int’l routes: IDT, LEXICO, TATA, VOXBEAM, and TELECOMSXCHANGE. 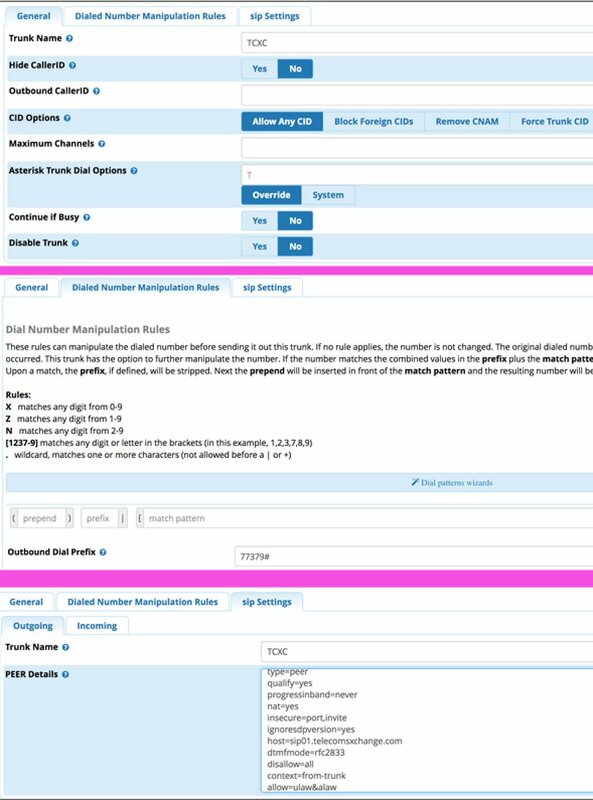 To set up the FreePBX Trunks and Outbound Routes, you first need to understand how calls are placed through TelecomsXchange carriers. In lieu of traditional trunk registrations on your PBX, TelecomsXchange uses the IP address that you registered for your account to determine whether SIP calls arriving at TCXC for routing to a carrier are authorized. Thus, it’s important that you keep your IP addresses updated whenever they change. Assuming your call passes the IP address check, the next hurdle is for TCXC to decipher which carrier should be used to route the call to its destination. This is handled by dialing prefixes which are unique to each TCXC carrier. For example, TATA has a dialing prefix of 32270#. To dial a U.S. call using the TATA carrier, the dial string would look like this: 32270#16785551212. A carrier must be assigned to your account before you can place calls from your PBX using that carrier’s dialing prefix. So there are two layers of protection on the TCXC side to prevent fraudulent calls. There must be both an IP address match and a carrier prefix match on your account before a call will be forwarded to a carrier. Before we begin setting up your Trunks and Outbound Routes for Incredible PBX or one of the other Asterisk platforms, write down the names of each of the carriers you have chosen as well as their Dialing Prefixes. You’ll need them in the next steps. You can decipher carrier’s dialing prefixes assigned to your account under the My Interconnections tab in your TCXC Dashboard. To begin, make certain that chan_SIP is assigned to UDP 5060 on your PBX. Particularly for trunks, there were just too many issues with PJsip in some releases of Asterisk so steer clear. 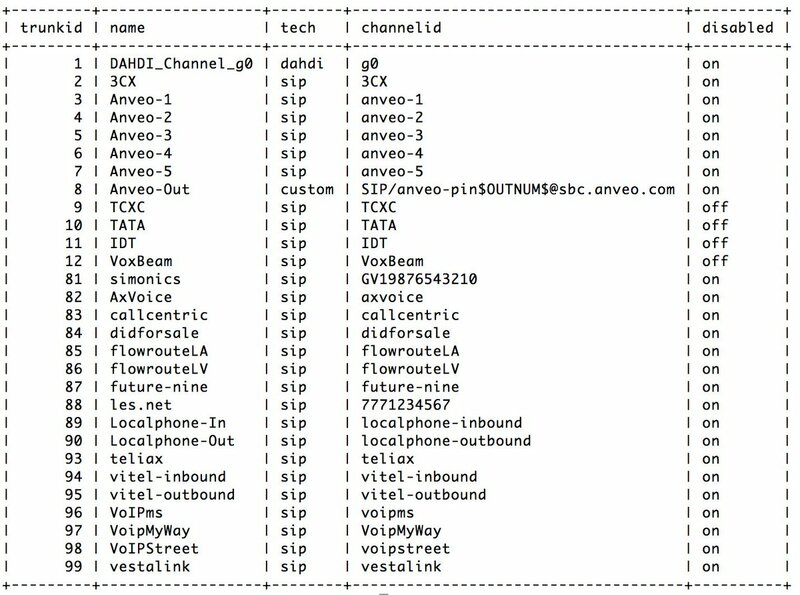 With every TCXC carrier, the good news is the chan_SIP Trunk setup is virtually identical except for the carrier name and the carrier’s dialing prefix. For each carrier, start by adding a new chan_SIP Trunk in the Incredible PBX or FreePBX GUI. In the General tab, insert the carrier name in the Trunk Name field, e.g. TCXC. Leave the other default settings as they are. Switch to the Dialed Number Manipulation Rules tab. Leave the Dialing Rules empty and insert the carrier’s dialing prefix in the Outbound Dial Prefix field, e.g. 77379#. While still in SIP Settings, switch to the Incoming tab, and clear out the default User Detail entries. Now click the Submit button and reload your dialplan when prompted. Repeat this procedure for each of the carriers you set up in your TCXC profile. Our preferred Outbound Route setup for TCXC carriers is to create a new Outbound Route for each destination (typically a country) to which you wish to enable calling. Be advised that setting up a dialing prefix of just the number 1 authorizes considerably more calls than just those to destinations in the United States. For foreign countries, if all of your calls to the U.K are to destinations in London, then don’t authorize country-wide calling. Narrow it down to the country code and city code for London. Remember, it’s your phone bill. For international calls, we prefer that callers enter a dialing prefix that specifies that it’s a long distance call plus a two-digit prefix representing the country abbreviation, not the dial code of the country. For example, for the U.K., we use 085 where 0 specifies long distance call and 85 is the phone representation for UK. We’ll then use the Outbound Route to strip off the caller’s dialed prefix and to insert the proper country code to complete the call. Here’s an example of the Asterisk call flow using IDT as the primary trunk with this Outbound Route. Keep in mind that TCXC was designed primarily for commercial resellers, not for PBX-level implementations. If your PBX is sitting in the cloud or is directly connected to the Internet rather than sitting behind a NAT-based router, then you’re good to go now. If, on the other hand, your PBX is sitting on a private LAN behind a NAT-based router, make certain that your router forwards all UDP 5060 traffic to the private LAN address of your PBX. 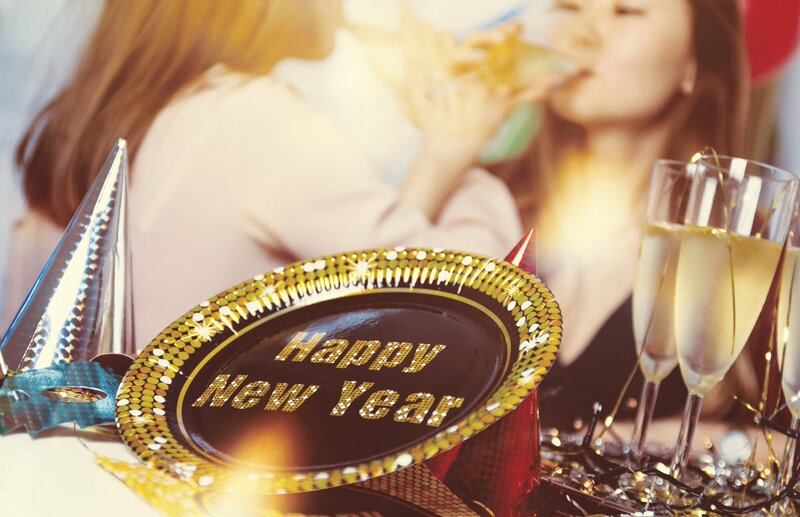 Otherwise, you may experience disconnect anomalies where the called party hangs up a call before your callers since there will be no call path for TCXC to return the disconnect alert (BYE) when the call is completed. For Incredible PBX servers, this isn’t really a problem because Incredible PBX will disconnect the call automatically after detecting 30 seconds of RTP traffic inactivity anyway. But we wanted to make you aware of the potential issue. The good news is you won’t be billed for the extra connection time since TCXC already has dropped the call with the carrier and turned off the billing meter. Your Inbound Route should specify the 10-digit DID. Enjoy!